The University of Pennsylvania is a leading biomedical research institution located on a compact campus in West Philadelphia that facilitates collaboration and resource sharing across laboratories, departments and schools. Biomedical research within the NINDS mission areas exists in several schools, including the Perelman School of Medicine, the School of Veterinary Medicine, the School of Nursing, the School of Arts and Sciences and the School of Engineering and Applied Science. The Children’s Hospital of Philadelphia (CHOP) is a leading pediatric medical and research institution located next to the Hospital of the University of Pennsylvania. Although CHOP is a separate organization from the NIH standpoint, CHOP investigators hold faculty appointments at the Perelman School of Medicine. The Moss Rehabilitation Research Institute (MRRI) in Philadelphia sponsors interdisciplinary research aimed at improving human function and adaptation to disability, with a focus on recovery from central nervous system injuries such as head trauma and stroke. MRRI is located approximately 5 miles from the Penn campus. These three institutions form a consortium that is supported by this NINDS P30 Center Grant. The University of Pennsylvania is situated on a single urban campus less than ½ mile in diameter. An initiative to consolidate research in neuroimaging and brain function on the Penn campus has completed its second phase, and will ultimately result in nearly all neuroimaging investigators being located in newly renovated space centrally located on campus. The space houses faculty, trainees, seminar space, and some of the available neuroimaging instrumentation. The Neuroscience Neuroimaging Center, Center for Cognitive Neuroscience (CCN), the Center for Neuroscience and Society, the Laboratory for Cognition and Neural Stimulation, the Computational Neuroscience Initiative, the Penn Image Computing and Science Laboratory, and the Center for Biomedical Image Analysis are now co-located in 30,000 ft2 of newly renovated space in the Richards and Goddard Laboratories, withadditional clinical neuroscience laboratories in Psychology, Neurology, and Psychiatry scheduled to move there in the subsequent phase, scheduled for completion in 2018. The newly-formed Penn Institute for Biomedical Informatics is also housed in the same complex, and will include a new visualization laboratory.The Richards and Goddard Laboratories Buildings are a designated National Historic Landmark and were designed by renowned architect Louis Kahn to facilitate research interactions. The majority of NNC personnel are located in Goddard-Richards.A new Neural and Behavioral Science building (Levin) was completed in 2016, and is approximately 50 yards from Richards and Goddard. This building houses additional cognitive neuroscience faculty and our Mock MRI. MRI scanners supported by the NNC are located in nearby buildings including the Stellar-Chance Laboratory (3T and 7T whole body MRI), the Hospital of the University of Pennsylvania (3T whole body MRI), the John Morgan Building (9.4T preclinical MRI), and the Smilow Translational Research Laboratory (3T whole body preclinical MRI). 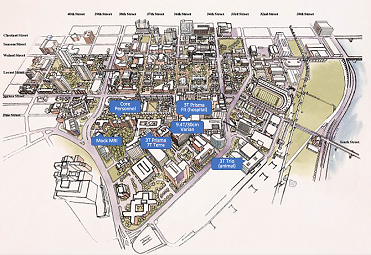 Campus map illustrating current and future locations for NNC. 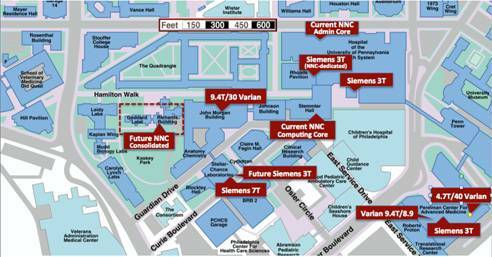 Campus map illustrating current and past locations for NNC (FY2016/17). Existing Resources at Penn Related to Neuroimaging. The Center for Magnetic Resonance and Optical Research (CMROI) is a NIBIB-funder Regional Resource that has been involved in imaging technology development and translation for over two decades. Dr. Detre leads the Functional Imaging component of this RR, which primarily focuses on the development and validation of arterial spin labeled perfusion MRI. Although the CMROI includes collaborative research, it is focused narrowly around technical innovation rather than infrastructure support. This P30 helps to disseminate technologies developed by its Cores on Functional Imaging and Optical Imaging. The Translational Biomedical Imaging Center in Penn’s Institute for Translational Medicine and Therapeutics (CTSA) supports the use of imaging in translational research primarily through a pilot project grant mechanism that supports approximately 5 pilot projects each year at a level of $50,000in all areas of imaging. Typically 1-2 pilot projects are in the area of neuroimaging. Dr. Detre and other NNC faculty participate in the review of these pilot projects. The Center for Cognitive Neuroscience (CCN) includes faculty from several schools on the Penn campus and provides infrastructure and educational activities, much of which centers on neuroimaging. Drs. Detre and Aguirre are Core faculty members of the CCN. The Center for Advanced Magnetic Resonance Imaging and Spectroscopy (CAMRIS) in the Department of Radiology is responsible for the maintenance, safety and staffing of the Siemens human research MRI systems in the Department of Radiology. Maintenance includes service, upgrades and cryogen refills. A local Siemens engineer is available to address malfunctions. A CAMRIS committee that includes representation from the NNC reviews applications for research MRI studies on the Siemens system for safety and feasibility. CAMRIS committee works closely with Penn regulatory authorities and provides approval for use of imaging facilities. CAMRIS collects an hourly usage fee for MRI use, currently $450/hr to cover the cost of scanner use, including maintenance and staffing by a certified MRI technologist. However, scheduling for the neuroimaging research is handled by the Administrative Core of the NNC. The Small Animal Imaging Facility (SAIF) in the Department of Radiology is a cost center similar to CAMRIS, but is focused on major instrumentation in the Department of Radiology available for preclinical imaging. This includes the Varian 9.4T/30 cm, 9.4T/8.9 cm and the 4/7T/40 cm systems supported by the NNC. Hourly scanning fees for use of these systems is currently $70/hr. The University of Pennsylvania has a complete ALICE-approved small animal care facility. The University Animal Care and Use Committee (IACUC) oversees the operation of all animal facilities, with daily care supervised by the University Laboratory Animal Resource (ULAR) Department. The University of Pennsylvania Health System (UPHS) is a leading Medical Center with extensive clinical programs and facilities. Many of the projects served by the Center Core will involve patients recruited from the clinical populations served by the UPHS. Children’s Hospital of Philadelphia is also a leading regional pediatric hospital and tertiary referral center. Investigators from CHOP have access to unique patient populations, including patients with congenital heart disease and mitochondrial disorders. The Moss Rehabilitation Research Institute studies a broad range of patients with brain injury. Each faculty member has office space and access to secretarial service through their own department. Space for the Administrative Core is in the Department of Neurology and includes a 150 ft2 office for Dr. Detre and an 80 ft2 office for the Core administrator. Each faculty member has a personal computer with Internet and email access as well as standard applications for word processing, web browsing, slide preparation, etc. The Neuroscience Neuroimaging Center currently has a cluster of approximately 50 Pentium or Opteron Linux workstations linked to 12 public terminals by a high speed network along with 50TB of RAID storage and backup. This cluster runs Matlab, IDL, AFNI and a variety of customized software environments. The computing infrastructure is in the process of being upgraded for the next project period. The Center for Advanced Magnetic Resonance Imaging and Spectroscopy (CAMRIS) in the Department of Radiology currently houses Siemens Sonata and Symphony scanners operating at 1.5 Tesla and 3.0 Tesla. There is also a Shared use 1.5 Tesla whole body MRI scanner (Siemens Avanto).The research scanners operated by the Center for Advanced Magnetic Resonance Imaging and Spectroscopy are located within the Hospital of the University of Pennsylvania (HUP) and are staffed with MRI technologists skilled in imaging research protocols. The scanners are equipped with full physiological monitoring capabilities, crash carts and are accessible to Hospital code teams. All scanners are capable of parallel imaging and equipped with a variety of RF array coils. An on-site engineer is available to maintain the scanners in the event of technical malfunction. A Siemens Magnetom Trio 3T whole-body MRI system is managed by the Neuroscience Neuroimaging Center exclusively for neuroscience neuroimaging and includes a 32-channel head receiver array. Extensive ancillary instrumentation is available on this system for fMRI. This Siemens Trio, will be upgraded to Prisma Fit in 2017 but will still be located in the Hospital of the University of Pennsylvania (HUP). A second neuroscience dedicated 3T MRI (Prisma) is also installed in the basement of the Stellar Chance Building adjacent to our 7 Tesla whole-body system. This system includes s 64-channel head/neck receiver and a 20 channel head-only receiver. The Prisma features “connectome” gradients with 80mT/m maximum gradient amplitude and 200 T/m/s maximum slew rate and a stabilized gantry that are optimized for DTI, along with and on-board GPU processor to allow rapid image reconstruction for multiband EPI and other high-throughput imaging. Ancillary equipment for this system includes an MRI-compatible LCD panel (InVivo SensaVue), noise-cancelling headphone/microphone (OptoAcoustics), fiberoptic button/trackball/joystick/grip force response system (Current Designs), in-bore video monitoring (MRC Systems), and MRI-compatible eye-tracking (SRS). A Siemens 7T whole-body research MRI system with a 32-channel head coil is located in the Basement of Stellar-Chance Labs, adjacent to Blockley Hall, on the Perelman School of Medicine Campus in space occupied by the Center for Magnetic Resonance and Optical Research Regional Resource. This system is being upgraded to a new Siemens Terra configuration, which includes the same high performance “connectome” gradients used in the Siemens Prisma scanner and native parallel transmission capabilities. Ancillary equipment for this system includes an MRI-compatible LCD panel (InVivo SensaVue), noise-cancelling headphone/microphone (OptoAcoustics), fiberoptic button/trackball/joystick/grip force response system (Current Designs), in-bore video monitoring (MRC Systems), and MRI-compatible eye-tracking (Avotek). As of October 1, 2015, NNC has a new mock scanner/MRI Simulator purchased from Psychology Software Tools, Inc. It is model # PST-100355 and equipped with MoTrak (motion tracking) and SimFx (sound simulation and presentation) Software, also from Psychology Software Tools, Inc. The mock scanner creates a realistic fMRI environment so that subjects may be desensitized and focus more easily on the tasks they are to perform. This new mock scanner was installed in Room C512 of the SOM Richards Bldg. but has recently moved. The current location of the CfN mock scanner is Room 304, Levin Building. A MagVenture MRI compatible system configuration based on the MagPro X100 with MagOption magnetic stimulator and the MRi-B91 coil is on order for use with our new 3T MRI system. This device provides the flexibility to do up to 100 pps (100Hz) stimulation rates. Besides the Biphasic waveform, it also offers capabilities to do Monophasic, Half Sine and Biphasic Burst (Theta Burst) waveform by simple selection from the screen menu, offers versatile trigger in/out capabilities to ensure easy interface with EEG, EMG and EP equipment, monitoring and read out of the realized output values (di/dt), storing and transferring stimulation/ system status data for each and every pulse in any given protocol. Within the user interface users can design and store up to 27 different protocols which can be easily recalled by simply push of a button. BrainAmp MR Plus System (Brain Products, Gilching, Germany) for recording EEG signal in the MR scanner simultaneously with fMRI acquisition in available. The hardware of this system consists of a MR-compatible amplifier, two MR-compatible power supplies, four 32-channel MR-compatible caps and three 14-channel MR-compatible caps specifically designed for sleep study. This system also include a complete set of software packages, including the Recorder for multifunctional EEG signal recording, the RecView for real-time data analysis and the Analyze2 for offline data analysis. The neuroConn DC-STIMULATOR PLUS is a micro-processor-controlled constant current source. It features multistage monitoring of the current path and by continuously monitoring electrode impedance it can detect insufficient contact with the skin and automatically terminate stimulation. A remote mode enables external control by a voltage supply source and filter boxes and cables are available for operation within an fMRI scanner. The fMRI module module allows artifact-free MR images even during EPI sequences and has been tested for 1.5 and 3 Tesla scanners. The Children’s Hospital of Philadelphia is adjacent to the Hospital of the University of Pennsylvania and houses Siemens MRI scanners operating at 1.5 Tesla and 3 Tesla. Investigators working in pediatric neuroimaging contract directly with the Department of Radiology at Children’s Hospital for research scan time on these systems. CHOP researchers also utlize NNC's MRI scanning facilities and receive aministrative and technical support from the NNC cores. The MR laboratories in the Small Animal Imaging Facility (SAIF) are located in two facilities. One is in the basement of the John Morgan Building in the Perelman School of Medicine and the second is in the basement of the Founders Building in the Hospital of the University of Pennsylvania but has moved to SmilowTranslational Research Laboratory on the Perelman School of Medicine Campus. This new facility also houses a shared use 3 Tesla whole body MRI scanner (Siemens Trio) for large animal MRI. The John Morgan facility houses a state-of-the-art Varian 9.4 Tesla horizontal bore small animal MRI system. This system is equipped with 12 and 21 cm gradient insert tubes with maximum gradient strengths of 40 and 20 G/cm and a switching time of 200 µsec (Magnex Scientific, Abingdon, UK). A fully equipped animal surgery room is adjacent to the MR installation, with the facilities for surgery and animal preparation for MRI imaging of large and small animals. This system is due to be upgraded to a Bruker console in late 2017 or early 2018. The 9.4 Tesla vertical bore is a three-channel DirectDrive system and is equipped with 5mm, 10mm and 20mm Varian and Doty double and triple tuned multinuclear high resolution probes. The system is configured with a 55 mm IB 100 gauss/cm gradient insert. A variety of resonators specifically designed for observation of tumor xenografts in mouse models have been constructed in-house for use with this system. In addition, 20 mm ID and 11 mm ID resonators suitable for high resolution MR microscopic imaging and high resolution diffusion tensor imaging (DTI) of fixed rat and mouse brains are available for use with this system. The PET Facility in the Department of Radiology at the Hospital of the University of Pennsylvania currently has three PET scanners, 2 whole-body PET scanners (UGM Medical Systems, C-PET Model 300C and ADAC, Allegro) and a brain-only GSO-cristal PET scanner which was built in collaboration with UGM Medical Systems. A small animal PET scanner (A-PET) is operating in the Small Animal Imaging Laboratory (Richards Bldg., Rm. 522C) built in collaboration with Phillips Medical Systems. This system has a very high spatial resolution (approximately 2 mm), with extremely high sensitivity and a large field-of-view. The PET Facility at the Hospital of the University of Pennsylvania has three scanner rooms, a control room, a computer room, hot lab and a blood lab for sampling and counting. A new cyclotron was recently installed. The Laboratory for Cognition and Neural Stimulation (LCNS) pursues research in cognitive neuroscience and behavioral neurology using noninvasive brain stimulation techniques, including transcranial magnetic stimulation (TMS) and transcranial direct current stimulation (tDCS). Located in the Goddard Laboratories at the University of Pennsylvania Perelman School of Medicine, the LCNS houses multiple TMS devices, including a Magstim (Whitland, UK) Rapid Stimulator, a Magstim Superapid2 Stimulator and a Magstim Bi-Stim paired pulse stimulator. The lab also employs multiple standard and air-cooled 70 mm figure-eight coils as well as sham coils. The lab utilizes the Brainsight Frameless stereotactic system (Rogue Research Inc., Montreal, Canada) for MRI-guided TMS research. Multiple Windows and Macintosh computers are employed to support Brainsite, stimulation presentation and TMS pulse delivery. The laboratory also employs a NeuroConn (Ilmenau, Germany) full-band NEURP PRAX® direct current EEG system for simultaneous TMS/tDCS and EEG recording. The laboratory includes all appropriate ancillary TMS equipment (e.g., ear plugs) and an EMG unit for recording motor evoked potentials. The laboratory also houses three battery-driven Magstim Eldith DC stimulators and sponge electrodes for administration of tDCS, as well as a Soterix (Soterix Medical, New York) 4x1 Multi-Channel interface for delivery of high definition (tDCS 9HD-tDCS). Laboratory space includes offices for post-doctoral fellows, graduate students and research assistance and a conference room as well as patient testing rooms. The laboratory has a wide range of equipment for cognitive-behavioral studies, including traditional neuropsychological tests (e.g., WAIS-R, Behavioral Inattention Test) as well as tests developed in the lab. General word processing, statistical and graphic software applications are also present. MatLab, Psyscope, E-Prime and other programs for experimental design are available. A fully operational optics laboratory (approximately 4,000 ft2) is located in the Laboratory for Research on the Structure of Matter (LRSM) in the Physics Department. The lab is equipped with a range of laser systems and a full complement of optical equipment. Two existing instruments utilize three laser diodes and drivers (675, 785, 830 nm) with coupling optics and fibers for sources. The sources are further coupled to a series of fast, optical switches (two 1x4 prism switches, DiCoN). A high coherence length external cavity laser (780 nm) from Crysta Laser with a stable laser driver, optical isolator and coupling optics is also used. Two high sensitivity, fast avalanche photo diodes (APDs) and two large sensor area photomultiplier tubes (PMTs), all from Hammamatsu, and eight high sensitivity, fast photon counting APD’s (Perkin-Elmer) are also used as detectors. Extensive radio-frequency (RF) electronics (RF oscillators, I/Q demodulators, electronic attenuators, amplifiers, shielded cables) from Mini-Circuits are used to encode-decode signals. A custom-built (Correlator.com) eight-channel multi-tau correlator board is used to calculate auto-correction functions of detected photons. Two A/D boards and two DIO boards (National Instruments) housed in a rack-mounted personal computer are used to control the instrument and record the data. A Dell 20 inch LCD screen displays the data and interface. A variety of custom-built probes housing a series of fiber-optics are used with the instrument to couple the instrument to an adult head. The portable instrument is housed on a 19-inch rack-mount medical instrumentation cart. Five laser diodes and drivers (675, 785, 830, 915 ___ nm) with coupling optics and fibers for sources are utilized. The sources are further coupled to a series of fast optical switches (one 1x16 and one 1x8 prism switches from DiCoN). A high coherence, high power diode-pumped diode laser (SDL) working at 800 nm is also used with an optical isolator, portable stabilized optical breadboard and coupling optics. Eight high sensitivity, fast avalanche photo diodes (APDs) from Hammamatsu and nine high sensitivity, fast photon counting APDs (Perkin-Elmer) are used as detectors. Extensive radio-frequency (RF) electronics from Mini-Circuits (FR oscillators, IQ demodulators, electronic attenuators, amplifiers, shielded cables) are used to encode/decode signals. A Correlator.com custom-built nine channel multi-tau correlator board is used to calculate auto-correlation functions of detected photons. Two personal computers are used to control the instrument and to acquire data. Each has two A/D boards and two DIO boards (National Instruments) to interface with the instrument. The interface and data are displayed on two 14-inch LCD screens. A custom-built fiber-optics probe (FiberOptic Systems) with a large number of fiber-optics are held in a grid and coupled to the back of a modified SLR camera (FM2N Nikon) is used to relay the light to and from the tissue. The instrument is portable on a custom-built rack mount set-up secured on an instrumentation cart. The source part consists of a collimated laser diode (Hitachi, HL 785 1G, 785 nm, 50 mW, Thorlabs) driven by a custom-made driver and coupled to collimating/focusing optics and a white light arc-lamp source (Oriel) coupled to optics and a fast computer-controlled filter-Wheel (ASI) with a selection of filters between 400-650 nm wavelength range. The data is acquired by a 12-bit, TEC cooled CCD camera (QImaging, Retiga 1350EX) using imaging software (StreamPix, NorPix) coupled to a 60-mm lens (AF Micro-Nikkor 60 mm f/2.8D, Nikon). Two Dell personal computers running in parallel are used to store the data and trigger various components. For triggering and high-precision timing, an A/D board (DataWave Technologies) is used. The data is stored on a fast RAID array (320 Gb) of hard drives working in parallel. The data and control interface is displayed on two 20-inch LCD Dell screens. The electronics facility at the Center for Magnetic Resonance Imaging and Spectroscopy (CAMRIS) supports the development of hardware for MR applications and provides training in the design, construction and safe handling of coils for MRI and MRS. This laboratory is equipped with state-of-the-art test equipment, including two network analyzers (10 MHz to 1.3 GHz), a vector impedance meter (1-100 MHz), a sweep generator (1-400 MHz), a spectral analyzer (1-400 MHz), two 500 MHz oscilloscopes, two frequency synthesizers (0-160 and 0-500 MHz) and a function generator. A facility also includes all necessary equipment for constructing coils and customized circuits. A fully equipped machine shop is available for fabrication and repair of devices for MR research, including phantoms, probes, coils and animal positioners.